Members and potential inductees of the Education Honors Society, Kappa Delta Pi, celebrated International Dot Day with their Color and Relax event in the Hudson auditorium on September 13. 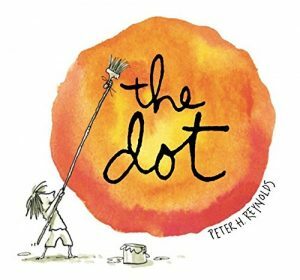 The event was based around Peter Reynold’s picture book, “The Dot,” which promotes creativity in children through connections. The book follows Vashti, a young girl who thinks she has no artistic ability, blossom in self-confidence with the help of her art teacher who encourage her to create a dot on a piece of paper. Her art teacher then frames and hangs the dot on the wall, which challenges Vashti to create a dot even better than her first one in an array of colors and sizes. She then finds the courage to share her creativity with another student by having him also draw a dot. 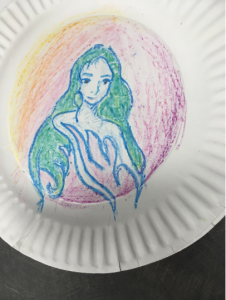 In the book Vashti’s art teacher tells her with a smile, “Just make a mark and see where it takes you,” so the education students at the event created their own dots with paper plates and crayons to do the same. This activity connected them to each other and to their future profession of creating impactful connections on students in grades kindergarten through twelfth.